Azure matches AWS pricing for comparable services. Pay direct and get the same price as you would through a Microsoft Enterprise Agreement. Meet your organization’s business needs and budget with competitive, pay-as-you-go pricing. Realize cost savings whether you’re migrating your first workload or fine-tuning complex deployments. Save big with Azure offers. Get price matching on comparable services and pay only for the resources you use. Keep costs in control with sophisticated tools. From dev/test to production workloads, realize additional savings that fit your development and deployment needs. Combine discounts and pricing offers to significantly reduce your cloud costs. AWS is 5 times more expensive than Azure for Windows and SQL Server1. Why run them anywhere else? Use your existing Windows Server and SQL Server licenses with Software Assurance to save big on Azure. Migrate 2008 and 2008 R2 server workloads to Azure Virtual Machines and get three more years of security updates following the end of your support dates—for free—resulting in significant cost savings. AWS is 5 times more expensive than Azure for Windows Server and SQL Server1. Get discounted rates for your ongoing development and testing, including no Microsoft software charges on Azure Virtual Machines and special dev-test pricing on other services. Forecast your resource needs and make a one- or three-year commitment on select Azure services to pay less than pay-as-you-go pricing. Exchange or cancel any time as your needs evolve. Pay only for the resources you use and cancel anytime. Estimate your expected monthly costs for using any combination of Azure products. *Price match available to the publicly available prices as of November 21, 2018 of eligible newest generation products in the same comparable geographic region only. Pricing adjustments in response to price drop by AWS can take up to 90 days to process. 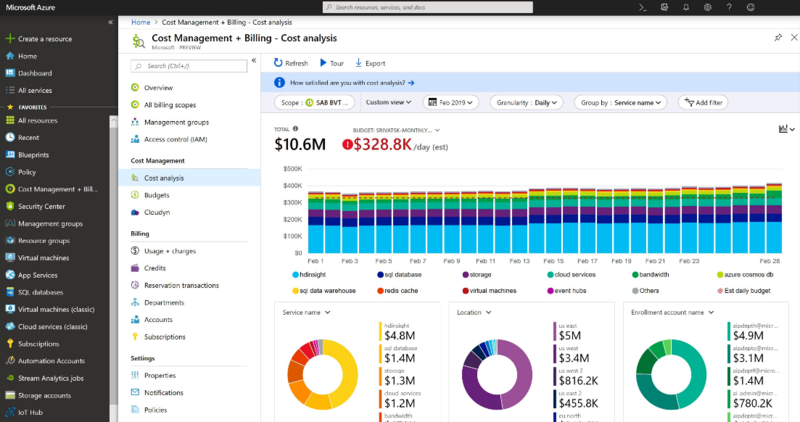 Take advantage of built-in tools and services to help you compare costs, save money, and optimize your Azure resources. Compare the total cost of ownership (TCO) of your on-premises infrastructure to a comparable Azure deployment. Estimate the savings you can realize by migrating your workloads to Azure. Monitor cloud consumption and cost trends continously. Improve organizational accountability by allocating cloud costs to business units and projects. Optimize and save by eliminating idle resources with virtual machine right-sizing. Find tools and resources to migrate your apps, data, and infrastructure at your own pace. Build solutions quickly and confidently with direct access to Azure engineers. Get automatic, personalized recommendations for optimizing your resources. Overcome problems with around-the-clock access to support engineers. Choose the plan that's right for you. Don’t have an Azure account? 12 months of free services—includes compute, storage, network, and database. 25+ always-free services—includes serverless, containers, and artificial intelligence. $200 credit to explore any Azure service for 30 days. Explore options for purchasing Azure. Pay through the Azure website, add Azure to an Enterprise Agreement, or purchase through an Azure partner. 1Calculations based on scenarios running 744 hours/month for 12 months at 3-year Reserved Instances or Reserved Capacity. Prices as of October 24, 2018, subject to change. Azure Windows VM calculations based on two D2V3 Azure VMs in US West 2 region at the SUSE Linux Enterprise Basic rate. AWS calculations based on two m5.Large VMs in US West (Oregon) using Windows Server Pay-As-You-Go rate for Reserved Instances under Standard 3-year term, all upfront payment. SQL Server calculations based on 8 vCore Azure SQL Database Managed Instance Business Critical in US West 2 running at Azure Hybrid Benefit rate. AWS calculations based on RDS for SQL EE for db.r4.2xlarge on US West (Oregon) in a multi AZ deployment for Reserved Instances under Standard 3-year term, all upfront payment. Extended Security Updates cost used for AWS is based on Windows Server Standard open NL ERP pricing in USD. Actual savings may vary based on region, instance size, and performance tier. Savings exclude Software Assurance costs, which may vary based on Volume Licensing agreement. Contact your sales representative for details. 2Calculations based on scenarios running 744 hours/month for 12 months at 3-year Reserved Instances. Prices as of October 24, 2018, subject to change. Savings calculations based on two D2V3 Azure VMs in US West 2 region, reduced compute rate at SUSE Linux Enterprise Basic rate with Azure Hybrid Benefit. AWS calculations based on two m5.Large VMs in US West (Oregon) using Windows Server Pay-As-You-Go rate for Reserved Instances under Standard 3-year term, all upfront payment. Actual savings may vary based on region, instance size, and performance tier. Savings exclude Software Assurance costs, which may vary based on Volume Licensing agreement. 3Calculations based on scenarios running 744 hours/month for 12 months at 3-year Reserved Capacity. Prices as of October 24, 2018, subject to change. Savings based on eight vCore Azure SQL Database Managed Instance Business Critical in US West 2 running at Azure Hybrid Benefit rate. AWS calculations based on RDS for SQL EE for db.r4.2xlarge on US West (Oregon) in a multi AZ deployment for Reserved Instances under Standard 3-year term, all upfront payment. Actual regional pricing and program discounts may apply. Actual savings may vary based on region, instance size, and performance tier. Savings exclude Software Assurance costs, which may vary based on Volume Licensing agreement. 4Calculations based on scenarios running 744 hours/month for 12 months at 3-year Reserved Instances. Prices as of June 15, 2018, subject to change. Savings based on 8-Core D13 v2 Azure VM in East US 2 region at CentOS/Ubuntu Linux with Azure Hybrid Benefit for SQL Server and Azure Hybrid Benefit for Windows Server. AWS calculations based on r3.2xlarge in US East (N. Virginia) at Windows rate with SQL Server License Mobility. Actual savings may vary based on region, instance size, and performance tier. Savings exclude Software Assurance costs, which may vary based on Volume Licensing agreement. Other cloud service providers may claim to have similar savings to the Azure Hybrid Benefit, but you’ll need to repurchase your Windows Server license on those clouds. And only Azure offers free extended security updates for Windows Server 2008 and 2008 R2. Uses the Azure Hybrid Benefit to pay reduced compute rate (SUSE Linux Enterprise Basic rate) for 3-year Reserved Instances. Software Assurance is required. Uses Windows Server Reserved Instances rate under standard 3-year term with upfront payment. Free extended security updates in Azure for Windows Server 2008 and 2008 R2 VMs. Extended security updates cost is based on Windows Server Standard open NL ERP pricing in USD. Only Azure offers savings across both platform as a service (PaaS) and infrastructure as a service (IaaS) for SQL Server. With the Azure Hybrid Benefit, you can use existing licenses with Software Assurance to pay a reduced rate on Azure SQL Database (PaaS). This is not included in SQL Server license mobility rights for other clouds. Uses existing SQL Server licenses with the Azure Hybrid Benefit to pay a reduced rate on Azure SQL Database with 3-year reserved capacity. Software Assurance is required. Uses 3-year Reserved Instances, a standard 3-year term, and all-upfront payment. Only Azure offers savings across both platform as a service (PaaS) and infrastructure as a service (IaaS) for SQL Server. With the Azure Hybrid Benefit, there is no need to repurchase software licenses—use existing licenses with Software Assurance to save on Azure Virtual Machines (IaaS). With the Azure Hybrid Benefit, you pay only the reduced compute rate (SUSE Linux Enterprise Basic rate) for the Windows Server VM. You’ll need to repurchase Windows Server on other clouds. And only Azure offers free extended security updates for SQL Server and Windows Server 2008 and 2008 R2. Uses the Azure Hybrid Benefit to pay reduced compute rate (SUSE Linux Enterprise Basic rate) with 3-year Reserved Instances. Software Assurance is required. Uses license mobility based on Software Assurance on SQL Server. The customer must still pay the Windows Server pay-as-you-go rate. Free extended security updates in Azure for SQL Server and Windows Server 2008 and 2008 R2 VMs. Extended security updates cost is based on Windows Server Standard and SQL Server Standard open NL ERP pricing in USD.